I guess we shouldn't be surprised that the anti-liberal anti-freedom and anti-religion candidates of this generation should pop up against circumcision. But in the U.S., I'm shocked. But will we rise up and make a big deal about candidates who want to restrict our parental and religious rights and choices? "He’s taking a strong public stance against circumcision. The Democratic candidate revealed in a little-noticed tweet last week that he was against the ritualized practice of cutting a newborn’s foreskin. But in an interview with The Daily Beast, he said that if he were elected he would incorporate that view into public policy, mainly by pushing initiatives meant to inform parents that they don’t need to have their infants circumcised for health reasons. 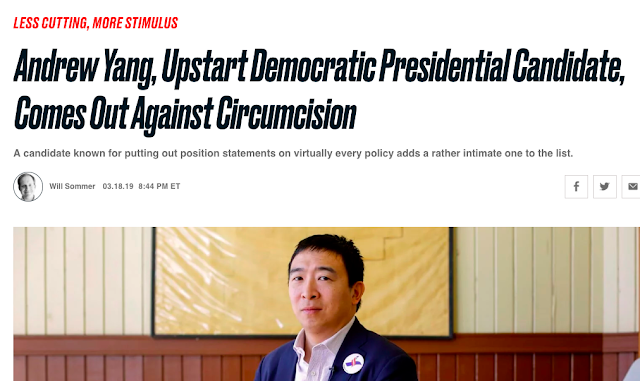 “It’s sort of pushed on parents in many situations,” Yang said, describing pressure to circumcise a child as a “cultural onus” imposed on families." ...because following your successful national culture and your successful religion is bad. Andrew, keep your hands off my children's zayin. No surprise because the news every day gets worse; it's all about going against G-D! The Dem party is no longer representative of the American ideals and has gone totally leftward. Anti-semitism is also part of their new agenda. May H' help b'rachamim to send us Moshiach tzdkeinu in a blink of an eye! Things are moving so fast.